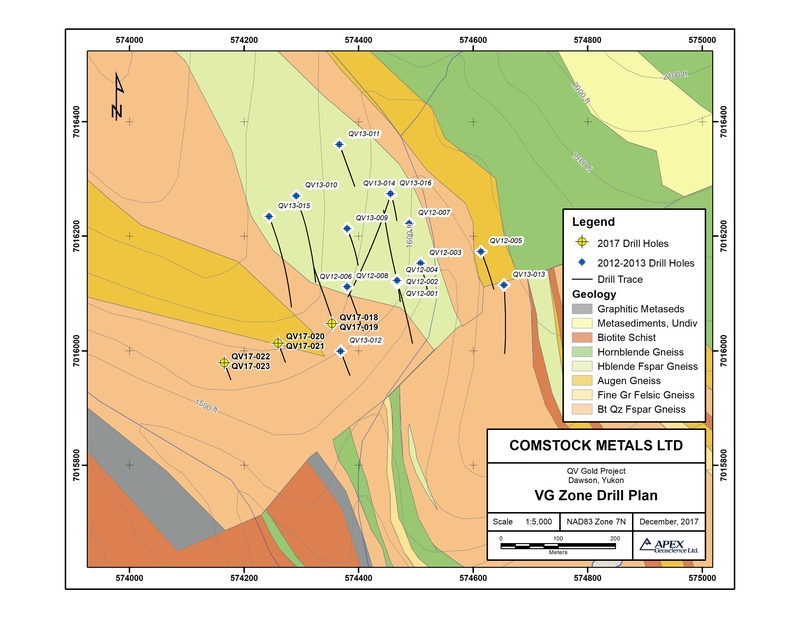 Vancouver, BC – December 18, 2017 – Comstock Metals Ltd. (TSX-V: CSL) (“Comstock” or the “Company“) is pleased to report the results from the fall diamond drilling program carried out at its +16,000 hectare QV gold project, located in the heart of White Gold district of the Yukon Territory (the “QV Property”). A total of 904.4 m of HQ drill core in 6 holes were drilled on the western flank of the VG gold deposit; 3 were completed to target depth while the remainder did not reach planned depth due to drilling problems related to faulting (Map 1). Drilling in this area was designed to follow up on the successful 2016 rotary air blast (RAB) drilling program (see December 19, 2016 news release) and extend the VG deposit footprint westward. 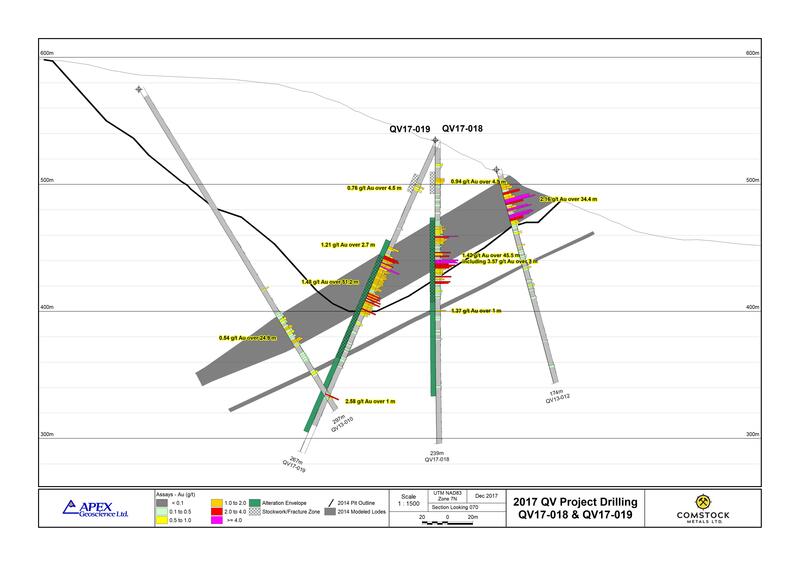 QV17-021, a 100 m step-out to the west of QV17-018/19, intersected an alteration zone with widespread anomalous gold mineralization extending from 87 m to 173 m down hole, including 4 m averaging 0.81 g/t gold starting at 139 m down hole, consistent with the interpreted western projection of the VG deposit but characterized by a rock package disrupted by considerable faulting and oxidation. “We are pleased to have validated the RAB drill results from 2016 through diamond drilling on the western flank of the VG deposit with two significant gold intercepts in holes QV17-018 and 019. I am encouraged that we are still seeing evidence of discrete zones of higher-grade gold mineralization. Although ground conditions at the western end of the VG deposit presented some difficult drilling challenges, we were successful in extending the limits of the VG mineralization to the west. Further drilling will be required to understand the faulting and the extent and distribution of the high-grade zones we have encountered in several of the western holes. We also have yet to drill test the eastern extent of the VG deposit which remains open” commented Comstock CEO David Terry. The VG gold deposit is located 11 km north of White Gold Corp’s Golden Saddle deposit on the southern part of the QV property and has similar geology and style of mineralization. Gold mineralization at the VG zone is hosted by quartz ±carbonate veins, stockwork and breccia along west-southwest trending, gently north-northwest dipping shears. Prior to the results reported herein, the Company completed 3,400 metres of diamond drilling in 17 drill holes in 2012 and 2013 which formed the basis for a maiden Inferred mineral resource totalling 4.4 million tonnes grading 1.65 grams/tonne (g/t) gold containing 230,000 ounces of gold at a 0.5 g/t gold cut-off1. In 2016 the Company completed 1,752.6 m of RAB drilling in 24 holes at the VG zone. The gold-in-soil anomaly over the VG zone consists of a 2 km long (with a 500m gap through a hornblende gneiss unit) and up to 400 m wide >10 ppb gold anomaly with a maximum value of 1277 ppb gold. The VG deposit remains open to expansion and is proximal to other untested sub-parallel structures. Drill hole location and orientation details are provided below in Table 2 and are shown on Map 1. Drill holes QV17-018 (-90°) and PR17-019 (-65°/340 azimuth) were drilled from a single pad located on the western flank of the VG Zone, and were designed to test the down-dip extension of mineralization in QV13-012 (Section 1). The holes passed through a variably altered and faulted suite of felsic gneiss lithologies. Both drill holes encountered wide zones of gold mineralization associated with pyrite mineralized quartz veins, stockworks and breccias. The mineralized zones are contained within a broader envelope of sericite-illite ±chlorite alteration. Silicification is observed locally, and is generally correlated with stockwork zones. Drill holes QV17-020 (-60°/160 azimuth) and QV17-021 (-90°) were drilled from a single pad 100 metres west-southwest of holes QV17-018 and QV17-019, and were designed to test the western extension of mineralization in the VG Zone (Section 2). Hole QV17-020 encountered a substantial fault zone and was terminated prior to reaching target depth. Hole QV17-021 passed through a variably altered and faulted suite of felsic gneiss (±augen) and schist lithologies. Numerous fault zones were encountered down hole, often associated with moderate to strong oxidation. Like holes QV17-018 and QV17-019, a broad zone of veining, stockwork and breccia was intersected, associated with sericite-illite ±chlorite alteration and variable pyrite mineralization; however, the stockwork and breccia zones appear less developed with generally lower volumes of quartz material and pyrite mineralization. Widespread anomalous gold mineralization occurs between 87 m and 173 m down hole, including 4 m averaging 0.81 g/t gold starting at 139 m down hole. 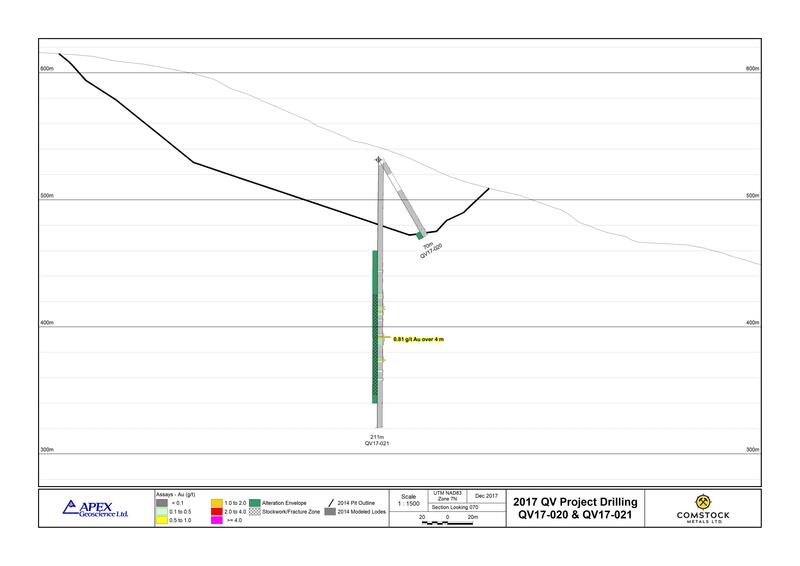 Drill holes QV17-022 (-65°/160 azimuth) and QV17-023 (-90°) stepped out 100 metres west-southwest of QV17-020 and QV17-021 to further test the western extension of mineralization in the VG Zone. Both holes encountered extensive faulting and were terminated prior to target depth. Kristopher Raffle P.Geo., Principal, and Christopher Livingstone, P.Geo., Project Geologist of APEX Geoscience Ltd., Qualified Persons as defined by National Instrument 43-101, supervised the exploration work and diamond drilling program at the QV project and reviewed, verified (including sampling, analytical and test data) and compiled the data reported herein. David A. Terry, Ph.D., P.Geo., a Qualified Person as defined by National Instrument 43-101, and an Officer and Director of Comstock, has reviewed and approved the scientific and technical disclosure in this news release.